Nice stuff! Hard to find! easy to dye to match! Very nice repro, hard to find it. Item recieved.THANK YOU for the great item! This item is same as original. 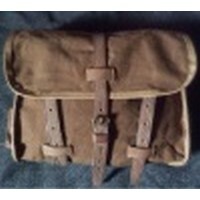 Great item for reenactors focused at 1st Czechoslovak Independent Brigade in Soviet Union or 1st Czechoslovak Independent Field Battalion in Soviet Union. Very good items indeed. perfect colour match for unnisued, I darkened mine with boot polish to better match the aged finish on the rest of my set. The grain is identical to the rest of the (original) set.